Around fifty heads of government will hold the world's first-ever virtual summit to renew political momentum in tackling climate change, Hilda Heine, the President of the Marshall Islands announced at the opening of the Global Environment Facility's (GEF) Assembly on June 27 in Da Nang, Viet Nam, to international acclaim. The carbon-free summit, on November 22nd, will bring together leaders of the 48-nation Climate Vulnerable Forum (CVF), which represents many of the countries most threatened by climate change. President Emmanuel Macron of France, Governor Edmund G. Brown Jr. of California and Naoko Ishii, CEO and Chairperson of the GEF, were among leading international figures who immediately welcomed it. The announcement was one of the highlights of an opening session which heard from heads of government and UN bodies, and top business leaders, and scientists. President Heine – whose low-lying country will soon assume the chairmanship of the CVF – said that the summit “will be convened entirely online as a 'Virtual Summit', showcasing our intentions to work in new and innovative ways, and to build broader coalitions across society for the change we need”. She added that her country – which played a leading role at the 2015 Paris climate summit – had committed to reduce its emissions by 32 per cent from 2010 levels, and would bring forward a “new and more ambitious target” for 2030, “even though our contribution to global warming is infinitesimal”. It had also taken strong action to protect the ocean on which it relies. President Heine told the 1,200 delegates, including representatives from all of the GEF’s 183 member countries, that the Marshall Islands was grappling with “an existential threat in the face of the growing environmental crisis”. But she added that the Assembly was “an engine room of hope” and was “at the forefront of efforts to help overcome this crisis, adding that the GEFs expenditure over the years “constitutes perhaps the most impressive single contribution to safeguarding the environment”. She explained: “Thousands of protected areas have been created, the integrity of hundreds of millions of hectares of land safeguarded, and support was made possible to critical watersheds around the world. “The work of GEF supporting developing countries with nationally-led emission reduction efforts and protection for millions of people vulnerable to climate change has saved lives and improved our chances for survival. GEF's contributions to addressing chemicals and pollutants played a pivotal role in paving the way for a recovery of the ozone layer”. She added: “We are putting huge pressure on the health of our planet. Every day we are receiving wake-up calls from nature: massive loss of forests and lands, species being lost, pollution of air and water. And we are suffering from increasingly visible impacts of climate change. “The GEF was created more than 25 years ago to help fight against these threats. Since then we have together done a lot of good work, and we are proud of it. But today we all need the courage to admit that the past success is not good enough. In his welcome address, Nguyen Xuan Phuc, Prime Minister of Viet Nam, told delegates; “Our Earth, the common home of mankind, is suffering from severe impacts of environmental degradation and pollution, climate change and the rise of sea level. As a result, all nations and peoples, with no exception, will have to face immeasurable consequences if we fail to come up with integrated solutions. 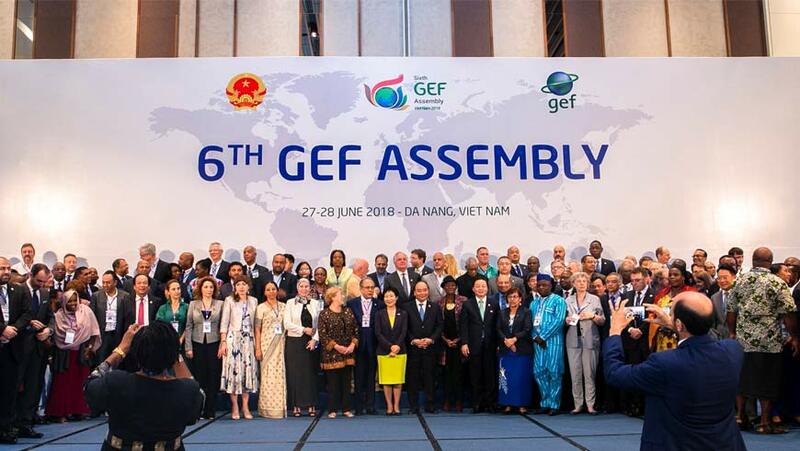 He said that the GEF “has been laying a significant role in addressing the great global environment and climate change challenges”, adding “Viet Nam is ready to work closely with you for sustainable development for the current and future generations”. Johan Rockström, Executive Director of the Stockholm Resilience Centre, described research showing that Viet Nam had done better than any other country in combining economic growth with environmental protection. Rosina Bierbaum, Chair of the GEF Scientific and Technical Panel, agreed: “We could be the first generation of humans to leave a legacy of irreversible problems”. Yet the delegates also heard messages of hope. Michelle Bachelet, former President of Chile, described how she had increased the country's national parks and marine protected areas, adding: “Any country can find areas with potential for change to move parts of the economy in the right direction towards sustainability”. Paul Polman, CEO of Unilever, said the Paris Climate Agreement had sent an “enormous signal” to business that things were going to change, while Suma Chakrabarti, President of the European Bank for Reconstruction and Development, said the world was “on the road to transformation”. Sunny Verghese, CEO of Olam International, said that it was part of the job of business to do good and Takehiko Nakao, President of the Asian Development Bank, said that political leaders saw sustainability as an issue close to their own agenda. Achim Steiner, Administrator of the United Nations Development Programme, said that reforming the economy was the key to the future. Ngozi Okonjo-Iweala, Co-Chair of the Global Commission on the Economy and Climate emphasised that it was important that environment and economy ministers learned each other's language. And Cristiana Paşca Palmer, Executive Secretary of the Convention on Biological Diversity, said that it was only by working together that the Earth could be steered in a different direction. Eric Solheim, Executive Director of UN Environment, called for a “can-do” approach and Andrew Steer, President and CEO of the World Resources Institute, said: “The direction the GEF is going, in forcing systems change, is so right”. Held every four years, the GEF Assembly brings together environment ministers and other senior officials from all its member countries, along with heads of UN agencies, regional development backs, civil society organizations and business leaders to share ideas, solutions and action needed to protect the global environment. Last month, close to 30 countries jointly pledged US$4.1 billion to the GEF for its new four-year investment cycle, (known as GEF-7), to better protect the future of the planet and human well-being. The Assembly is taking place from June 27-28, 2018 at the Furama International Conference Center in Da Nang, Viet Nam. It was preceded by the 54th GEF Council Meeting on June 24-26 and the 24th Least Developed Countries Fund/Special Climate Change Fund Council Meeting and a Civil Society Forum on June 26. Follow what is happening at the Assembly on twitter #GEFAssembly and click here to watch interviews from the GEF Live digital media studio. For more information and updates, visit the 6th GEF Assembly website.